Sean and I saw Cappadocia on a travel show a couple years ago. It looked incredible. 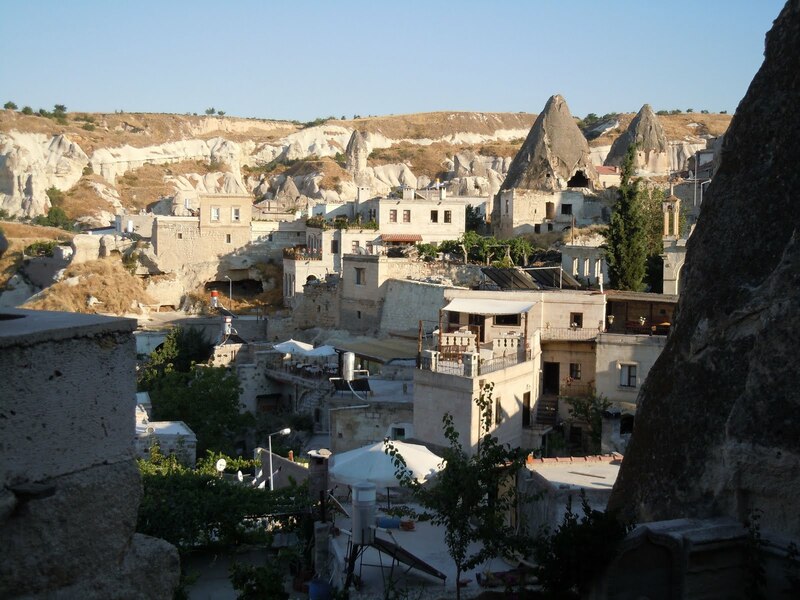 Try Google image searching 'cappadocia' right now: it's full of crazy scenery. But we were both like 'we're never going to go there.' It's too far off the beaten path and there's a lot of cool places we need to see first. But once you're in Turkey, it's not that hard to get to. And it looks just like the pictures. These are just the views around our hotel, so nothing really cool. 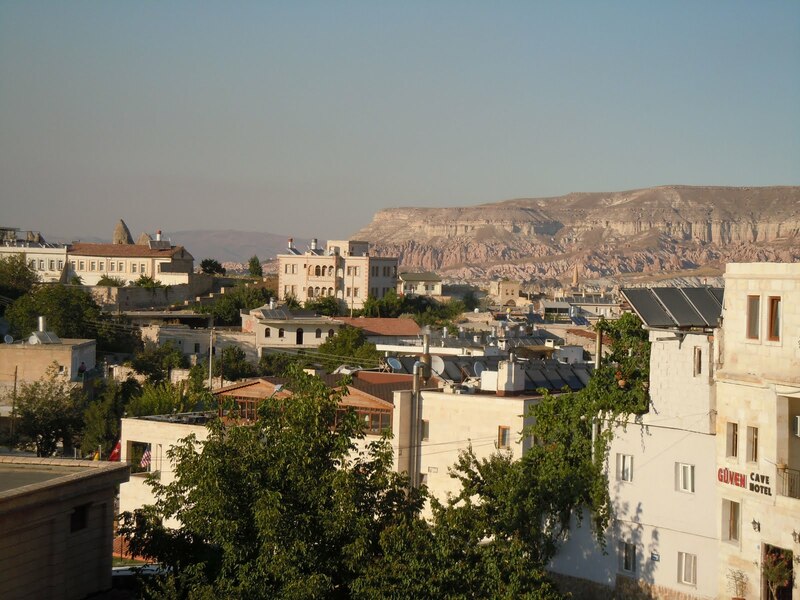 To get to Cappadocia, we flew from Izmir back to Istanbul and out again to Kayseri. 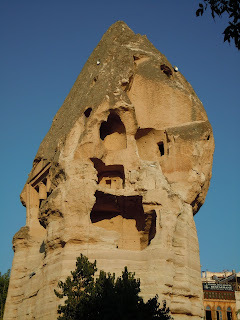 Then, a van from the hotel picked us up and took us the 1 hour drive to Göreme. The area around the airport was all golden color fields and mountains. And the roads are pristine-ly new but with very few cars. It was like being in the Central Asian Steppe, if I actually had any idea what that is like. Three volcanos ring Cappadocia and erosion of the layers of volcanic ash is the cause of the crazy rock formations you see in the area. The things to see are the scenery, the Byzantine churches in caves cut into the rock, and the underground cities. Taking a hot air balloon ride is very popular and must be spectacular, but you do have to get up at 4 for the sunrise flight and we opted to skip that. We stayed in Göreme, which is basically a backpacker town. If you're looking for a more upscale vacation, you might prefer to stay in some neighboring town. 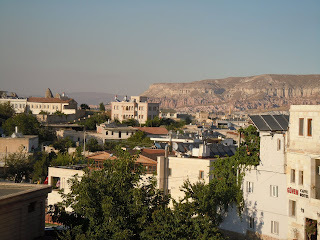 We stayed at the Kelebek hotel, which is one of the original cave hotels. We took the cheapest room with a private bath, but, be warned, those rooms have windows out on the path between the entrance and the restaurant and people outside will wake you several times a night. Two things about traveling in Turkey. We had fairly good (and free) wifi in our room at every hotel we stayed at, which is better than you could expect in the U.S. or in Europe. We also had tiny bathrooms in every hotel except at Kelebek. In a room carved into rock we had a fabulously large shower. Finally, remember what I said about every tour having 'shopping stops?' 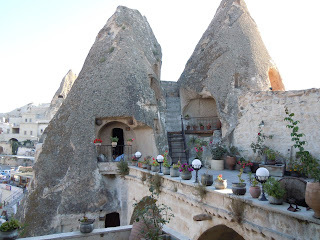 Well, we pre-booked with a reputable company in Cappadocia, and it was fine. But what isn't mentioned in the guide books or even on the tour company websites -- and would have definitely swayed our choice -- is that Heritage Travel (which operates out the Kelebek) doesn't have shopping stops. You'd think they'd advertise that fact more. Awesome photo's. Hope your having a great time. Thanks for sharing. Göreme is a wonderfull place. It's at Turkiye and I'm from Turkiye. (: I came there really fantastic.